Blowflies cause a very significant problem in meat processing plants, commercial canteens, food preparation areas and domestic kitchens. The female blowflies deposits her eggs by 'blowing' the eggs in clusters onto the meat or meat products. This renders the contaminated meat unsuitable for human consumption. 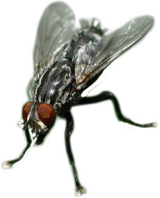 House flies are known to transmit enteritic diseases such as gastro-enteritis and dysentary and are inplicated in the spread of typhoid and cholera. They will settle and feed on all types of food material. The adult fly ejects saliva onto a solid food which, when disolved can be sucked back up. This process results in drops of vomit being left during feeding. They also leave dark specks, which are an indication of the flies defication (commonly known as fly spotting). This species belongs to the same family as blowflies. The only difference being the female gives birth to live larvae. These immediately burrow into live food ejecting enzymes which dissolve the meat and provide a liquid food supply. With most fly species hygiene and proofing are the most important factors. Windows should be screened with fly mesh, all food and waste bins should be covered, drains and gullys (particularly near kitchens) should be cleaned frequently. Spraying with residual insecticides to the breeding sites and areas where the flies congregate should prove effective. Electronic flykillers and flytraps may also be used to control flies in sensitive areas. Identified by the golden hairs on the thorax, cluster flies congregate in large numbers in roof spaces and voids and on the south and southwest facing exterior walls of buildings. This 'clustering' occurs in the autumn when they are seeking harbourage from the colder weather and again in the spring when they emerge from the harbourage. More of a nuisance pest than a public health pest, cluster flies can cause significant distress due to their large numbers and dead flies can contaminate products. Adult cluster flies feed on nectar from plants and are not associated with dead animal bodies. Cluster flies in roof spaces or farm buildings may be controlled with a residual or ultra low volume (ULV) insecticide. A residual insecticide may also be used on exterior walls and window frame where flies are congregating. Where flies are entering rooms though wooden sash windows, some proofing may be necessary.